The basic mechanism is the same as every option spread market – a fixed payoff for getting the “bet” correct, in this case 10. Predictious is now bringing this to the next level by offering a new type of derivative contract: option spreads on the price of Bitcoin. In the past couple of weeks, Bitcoin has been extremely volatile, and it is important for traders to be able to reduce risk, and hedge their Bitcoin position. They can now do so in an easy and cost efficient way by using option spreads. Option spreads are very versatile, while still offering limited risks. A bullish investor can use a vertical spread to benefit from Bitcoin gains, while limiting risks if the price crashes. On the other hand, bearish investors can use them to short Bitcoin. Predictious is currently one of the most reliable way to do so. Since losses are limited with option spreads, investors are not exposed to counterparty risks, like they would be when trading futures on competing services. Aside from Bitcoin traders, miners can also use spreads on the Bitcoin difficulty to reduce risks associated with investing in mining hardware. 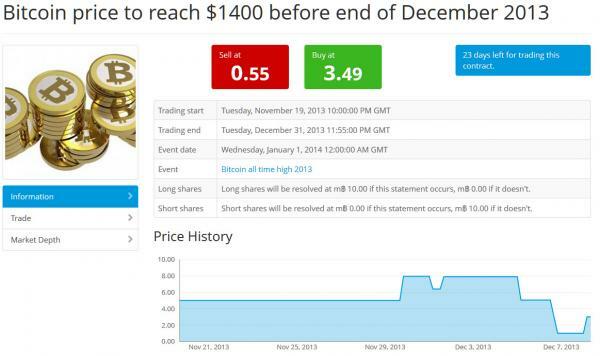 To date, Predictious users have deposited over $300,000 in Bitcoin on the website. “Traders are obviously very interested in Bitcoin derivatives, but the number of businesses accepting payments in Bitcoin has surged in the past few months”, said Flavien Charlon, Founder of Pixode, “those businesses have expenses in US Dollar, or Euro, and need to hedge their Bitcoin position. The type of derivatives we are offering will be very useful to them as well”. The bottom-line is that while we can see the ‘use’ of such a market to enabling some lower cost hedging of any wealth one might have gathered in Bitcoin, we suspect – just as in the case of many other assets – that the underlying asset will see its volatility rise as the derivative (and levered) markets becomes the tail that wags the dog.